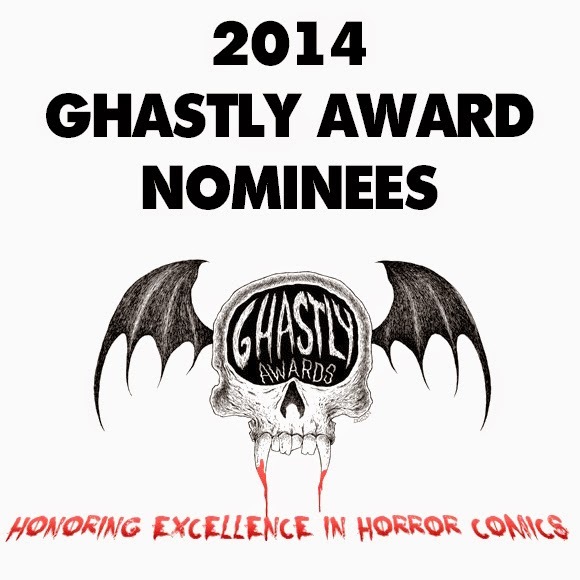 The Ghastly Award Judges are proud to announce the 2014 Ghastly Award Nominees. The Nominees, chosen by the Ghastly Award Judges, reflect the wide range of Horror material being published in print and web comic form today. All Nominees were selected from work that was submitted by Comic Publishers and Creators throughout the year for Ghastly Award consideration. Named after acclaimed comics creator “Ghastly” Graham Ingels, the awards are now in their 4th year. Fan and Creator Voting will be open from February 9, 2015 until February 22, 2015 at www.ghastlyawards.com. You may only vote once for the 2014 Nominees, and Fans will decide the winner of the Best Horror Comic Cover Award. Winners will be announced on March 1, 2015. Presented for their commitment to carrying on the legacy of Horror Comics for generations to come. The Ghastly Awards congratulate all of the Nominees for what they bring to the comic reading community. To be nominated by the Ghastly Award Judges is an honor and the Ghastly Awards are here to celebrate these achievements.